Planting Dates: In the spring after danger of frost. Some gardeners recommend planting when the full moon is near. That would be the second quarter. Others recommend the firstt quarter. For a fall crop, plant 80-90 days before the first average frost date. In general, March 15 - April 30 and June 1 - August 15. Planting Method: Plant seed in the garden soil after it has warmed in the spring. Seed can be started in a greenhouse and transplanted outside later for the earliest possible corn. Use 3-4 seed per foot of row 1-1 ½ inch deep. Harvest Time: When corn silks wither (about 18-24 days after first silks appear) and the ears are full. Best technique to make sure is to pull the husks back and look at or taste the corn. When gone past its prime, corn can be used in soups and stews. Sweet corn is best when eaten fresh out of the garden. Harvest is usually in 60-95 days. Final Spacing: Two methods: hills of 4-6 plants 3-4 feet apart, or in rows, 3 feet apart. Thin seedling to 10-12 inches apart. Growth Habits: Tall growing grass with seed pods that contain deliciously sweet seed we eat as corn. Culture: Corn needs loose, healthy, well-drained soils. Use lots of compost, organic fertilizer and lava sand for best results. Sugar at 5 pounds per 1,000 square feet and humate at 10 pounds per 1,000 square feet. 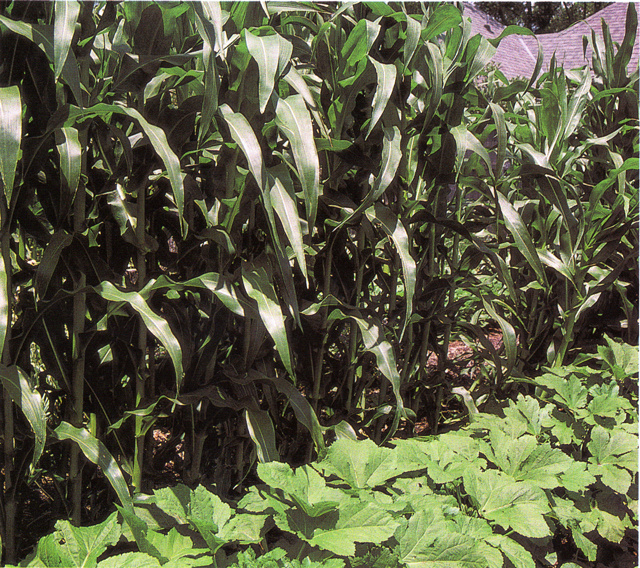 Plant corn when the soil is 60° or warmer. Make sure young seedlings don’t suffer from lack of water. Some gardeners recommend “dirting” the plants when they are about 12 inches high by covering the base of the plants with soil. Mulch is probably better. Corn takes more fertility than most other crops. Sidedress twice: the first time when the plants are about knee-high, the second time when the tassels and silks form. Fertilizer helps to make good ears. Use about half handful of organic fertilizer per plant or about 3 cups per 25 feet of row. Troubles and Solutions: Poorly filled ears result from poor pollination. To avoid this, don’t plant long, single or double rows. Plant in blocks, hills, or three or more rows. Downy mildew, mosaic virus, and other diseases can be controlled with Garrett Juice plus garlic and potassium bicarbonate, and by applying cornmeal and other biological products to the soil. Corn earworm can be controlled with beneficial nematodes and Bt products. Rolling of leaves can be caused by high temperatures, low soil moisture, excessive fertilizer, soil-borne insect and disease pests, or too much soil moisture. If you don’t want the weeds, pull them and mulch. 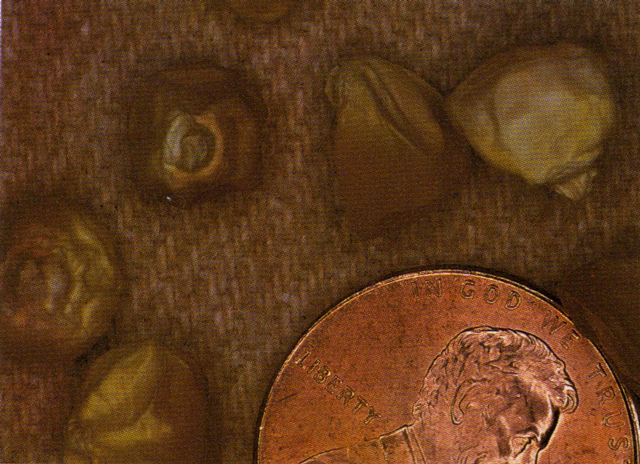 Harvest and Storage: Harvest the ears as soon as the silks have turned brown and dry. Open some husks and check. Pull the ears downward and twist off the stalks. This limits damage to plants and ears. For the best flavor, eat the ears as soon as possible. Put in bags and store in the refrigerator if necessary for up to 3 weeks at 32-40°. Notes: Don’t overcook corn. Cook the ears just long enough to heat the kernels. Many gardeners worry about weeds in the cornfield. Weeds are more of a cosmetic problem than a production-limiting problem. Often the weeds serve as a green manure crop and can increase soil fertility. Just don’t let them get too tall.